At my house, summer entertaining tends to be very simple”—casual, salad meals or barbecue on the terrace. But every now and then I want something a little “dressier.” This elegant fish terrine fills the bill. 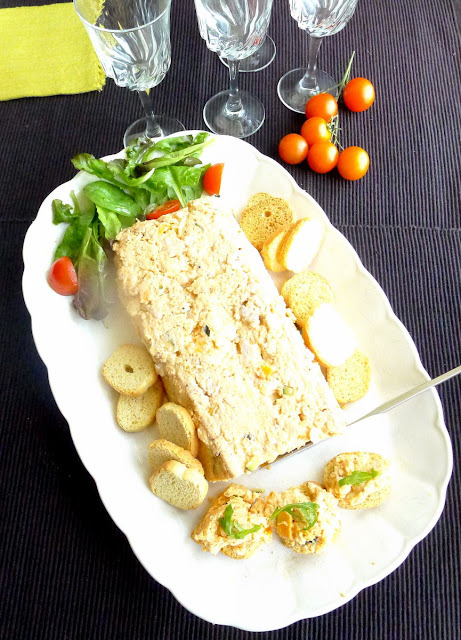 Cold fish terrine, lovely for summer entertaining. Prepared a day or two in advance, the terrine is served cold. It can be sliced and plated as a starter or served, like a pâté, as an apperitif, with mini-toasts to spread it on. 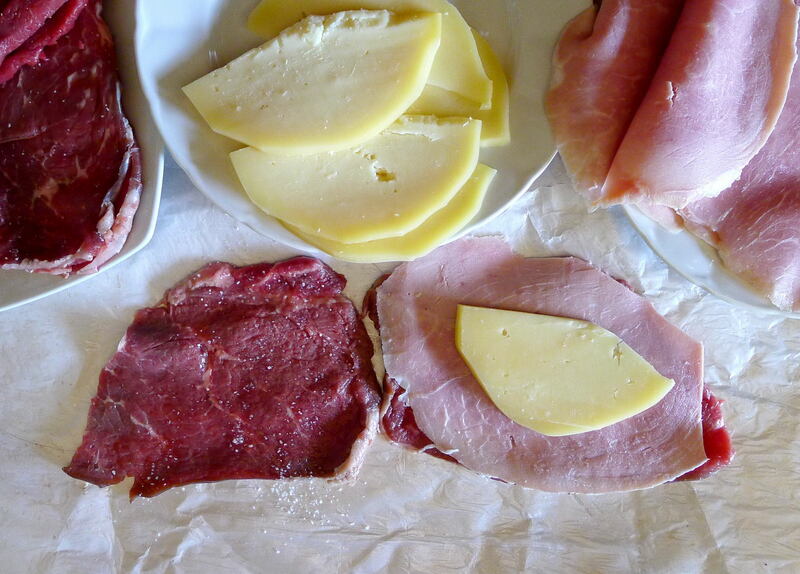 In either case, a fruity white wine or sparkling cava goes very nicely with it. 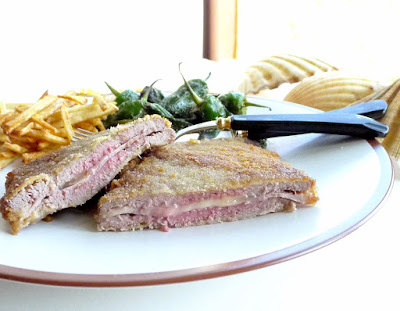 My terrine is a variation (I´ve added chopped zucchini and carrot) of the famous pastel de cabracho of three-star Michelin chef, Juan Mari Arzak. 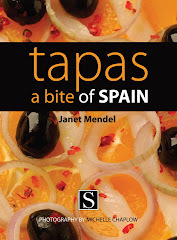 Back in the 1970s it became a signature dish of the nouvelle cuisine Basque, according to Chef Jeffrey Weiss, who includes a recipe for Chef Arzak’s terrine in his book, CHARCUTERÍA--THE SOUL OF SPAIN (Surrey Books-Agate; 2014). Cabracho, scorpion fish, has big flavor. 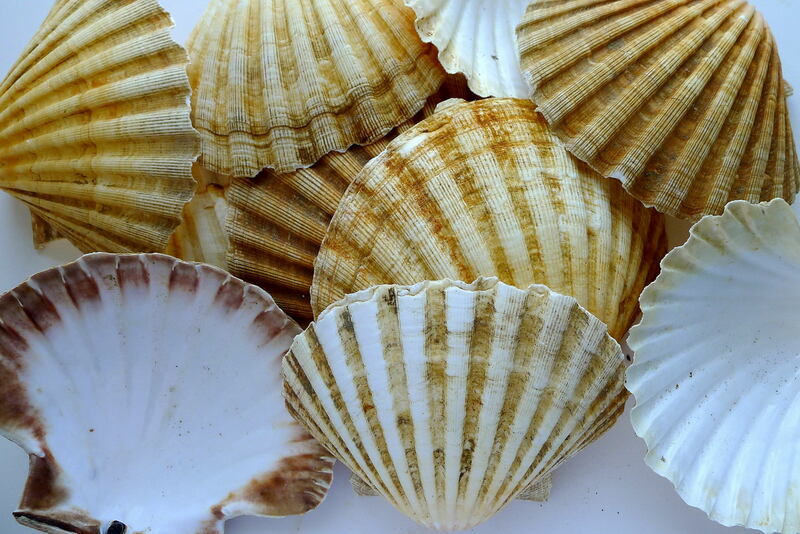 Redfish, rockfish and sculpins are related species and could be used in place of the scorpion fish. 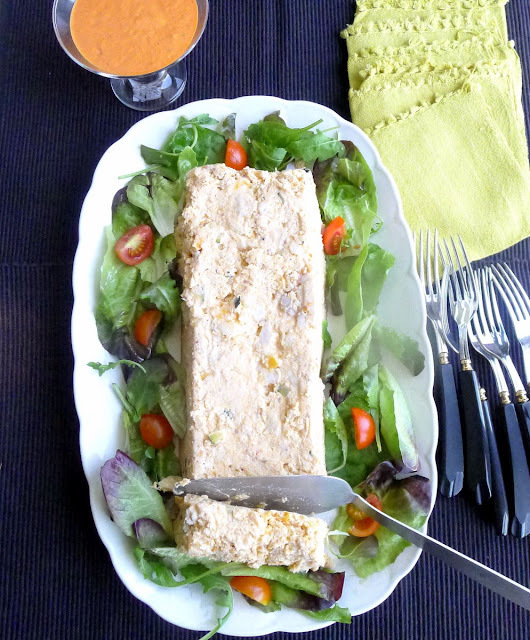 Or, you could use any fish you like for this terrine. Salmon would work. Slice the terrine and serve as an elegant starter. If possible, have the fish vendor prepare the fish. Scale and gut it. Cut off and save the large, bony head. Split the head in half. Open up the body section, but don’t worry about removing the spine yet. 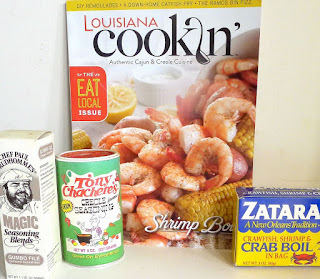 To make the broth for poaching the fish, I used a spice and herb blend called Louisiana Crab Boil (because I just came back from New Orleans and I'm using it for everything!). Like mixed pickling spices, it contains mustard seed, coriander seed, cayenne, bay leaves, dill seed and allspice. After cooking the fish and flaking the flesh, the head and bones can be returned to the broth to make a flavorful stock, which can be frozen for a future use. Flaked fish for the terrine. 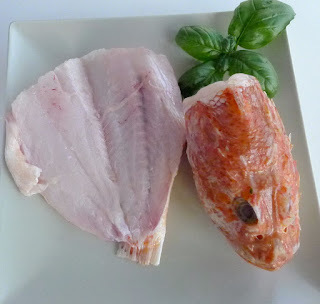 The flesh of the scorpion fish is white. It is tomato sauce that gives the terrine its salmon color. 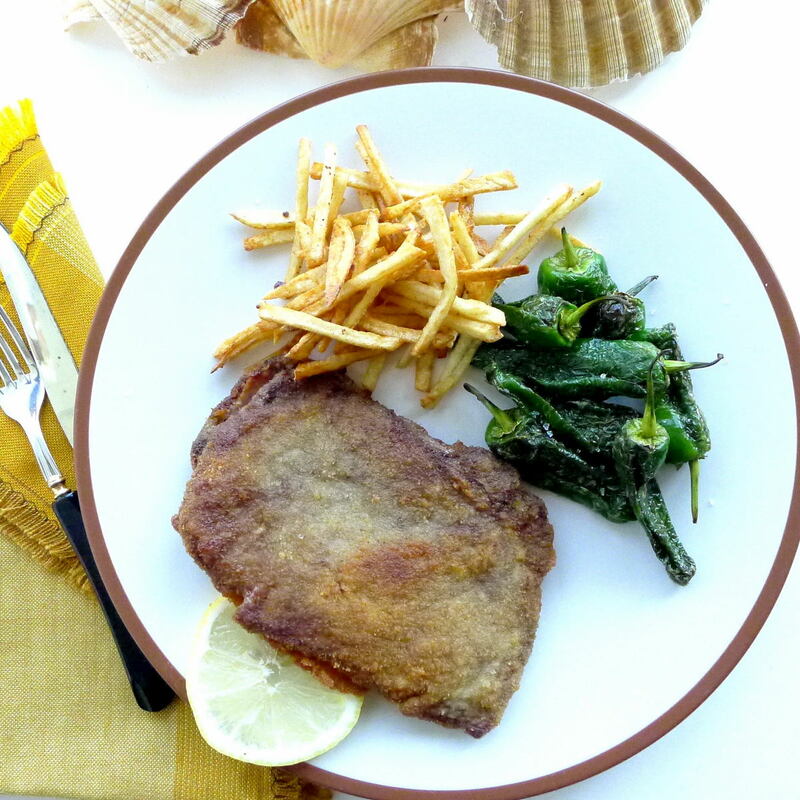 Use homemade tomate frito (recipe is here) or canned tomato sauce. I watched a TV chef make pastel de cabracho (check it out here.) He lined the mold with plastic wrap. 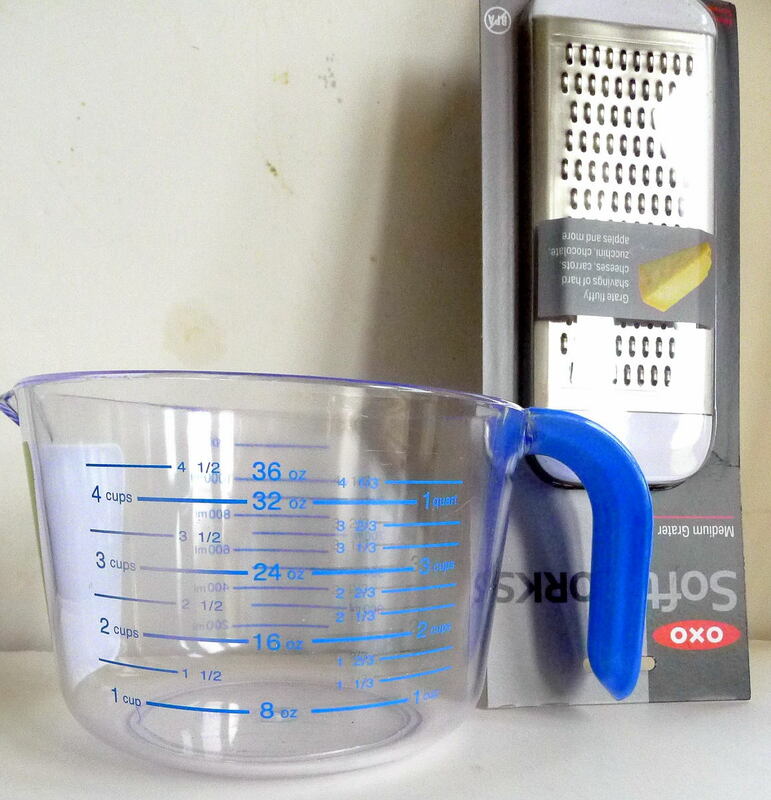 The terrine bakes at a very low temperature, so the plastic film doesn’t degrade. It really seemed to help in unmolding the terrine. However, all I had was a really low-quality plastic wrap and I did not want to chance using it. So, I did have trouble unmolding my terrine, which emerged in two pieces. 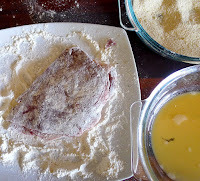 However, the soft-set terrine can easily be smooshed together and smoothed with a palette knife. Serve the terrine with a sauce, if you like. I riffed on salsa rosa (pink mayo), by substituting fire-roasted red peppers for the ketchup. Smooth over any breaks with a palette knife. Looks pretty good! Sprinkle the fish head and opened body section with salt and allow to set for 30 minutes. Bring the 6 cups of water to a boil with the mixed spices, carrot, celery, leek and 1 teaspoon salt. Boil 10 minutes. Lower the fish head and body into the fish broth. Cook 4 to 5 minutes. Use a slotted spoon to lift the fish head and flesh from the broth. Remove and reserve the carrot too. Let the fish cool. Set the pot of broth aside. Once cooked, it's easy to remove bones. Use your fingers to shred or flake the fish, removing any remaining bones. Cover and refrigerate until ready to use. In a medium skillet, heat the oil and sauté the chopped leek until softened, 3 minutes, without letting it brown. Add the diced zucchini and cook 3 minutes more. Stir in the wine and cook on high until liquid has evaporated. Dice the reserved cooked carrot and add it to the skillet. Add the cream to the skillet with the vegetables.. Bring it to a boil and immediately remove from the heat. Pour the contents of the skillet into a mixing bowl. Stir in the tomato sauce, then whisk in the beaten eggs. 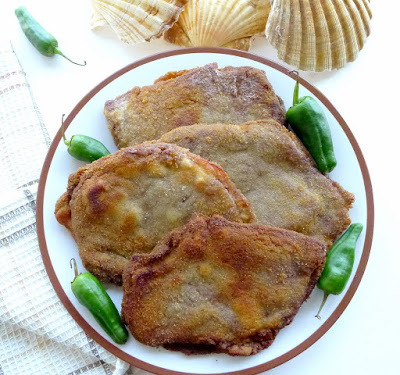 Season with salt, pepper and pimentón. 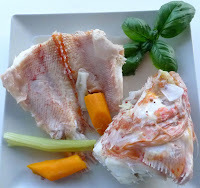 Fold in the flaked fish and the shrimp. Set terrine in pan of water. Have ready a 2-quart terrine mold that has been lightly oiled and dusted with bread crumbs. Pour the fish mixture into the mold. Set it in a larger pan and place on oven rack. 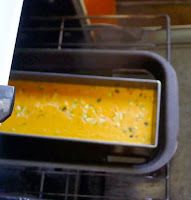 Add boiling water to the larger pan to half the depth of the terrine mold. 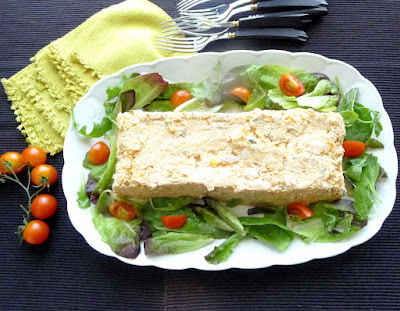 Bake the terrine 10 minutes. Lower heat to 250ºF. Bake until a skewer comes out clean, about 90 minutes. 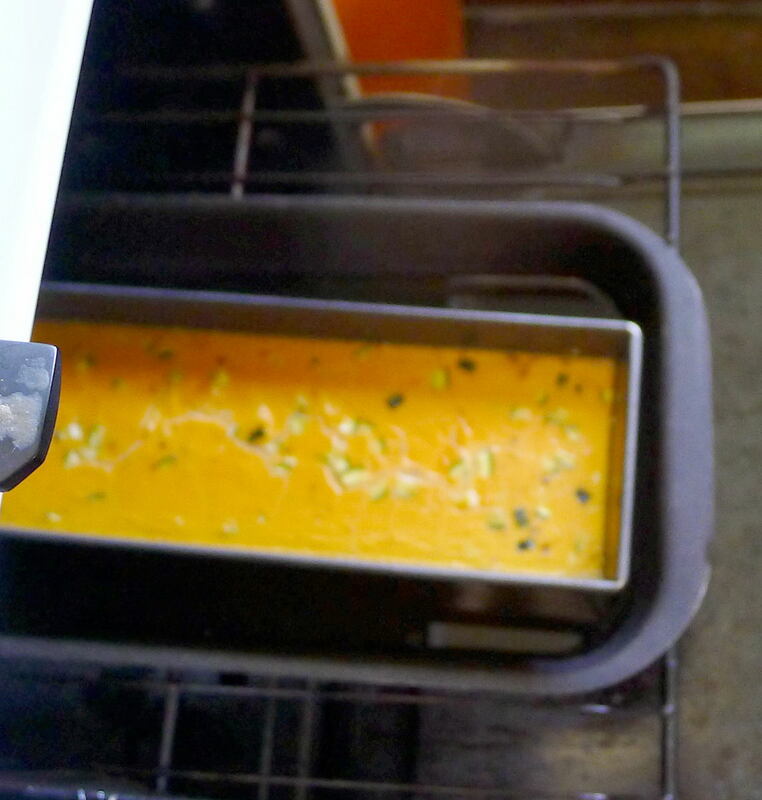 Remove the terrine from the oven and from the pan of hot water. Allow to cool to room temperature. 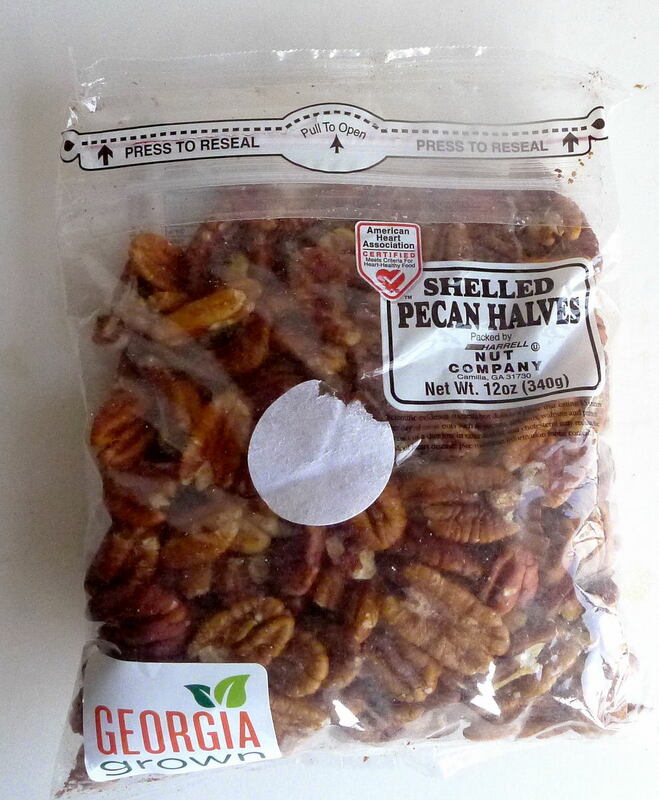 Cover and refrigerate at least 12 hours and up to 36 hours. Run a knife around the edges or the terrine. 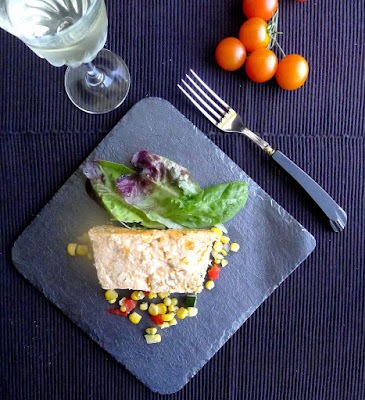 Place a serving plate on top of the mold and carefully turn it over, allowing the terrine to unmold onto the plate. 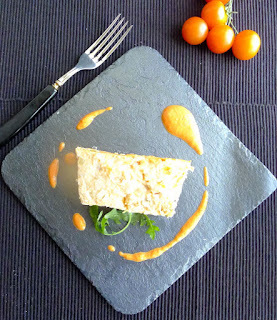 If not to be served immediately, cover with plastic wrap and refrigerate (up to 2 hours). To serve, slice the terrine and place on individual plates garnished with salad greens or serve it on a buffet table accompanied by crisp toasts. Serve with sauce, if desired. Serve the terrine with sauce or without. Blend all of the ingredients. Serve cold. In my herb garden is a little shrub that I had thought was manzanilla, chamomile. 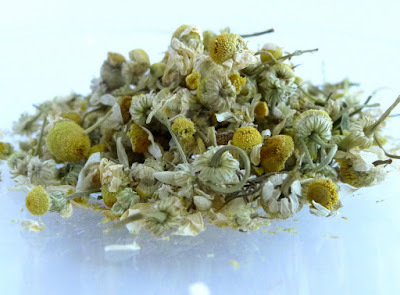 When it began to flower, I started looking for ways—besides the familiar, soothing tea—to use chamomile. I found an intriguing recipe in Food & Wine magazine that called for cooking chicken with chamomile flowers and, on a blog, the idea of infusing cream with chamomile, chilling it and whipping it to serve with berries. But, when I picked the yellow flowers and sniffed them, the scent was definitely not chamomile! (Still haven’t identified my mistaken-identity herb.) By then, I was launched on my chamomile project, so I visited the herboristería in my local market and bought a packet of dried manzanilla flowers. Three kinds of manzanilla--wine, olives, herb. 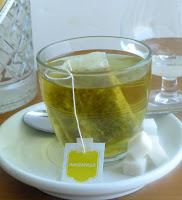 Chamomile in Spanish is manzanilla. In Spain, three unrelated products are called manzanilla. 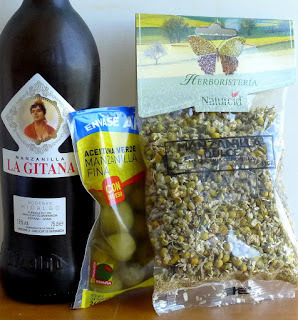 One is the herb, chamomile (matricaria recutita), commonly used as an infusion; another is Manzanilla Sherry, a fino made in Sanlucar de Barrameda, and the third is a variety of olive tree grown in Andalusia and source of the world-famous Sevilla olives. "Manzanilla" means “little apple” and the herb apparently was named in Greek for the resemblance of the flower to a little apple. However, the wine takes its name from the town of Manzanilla (in the province of Huelva, near the Sherry district), which traditionally made a similar style of wine. The olive variety, as far as I can tell, is named because the fat olives somewhat resemble “little apples.” I also detect a slight similarity in flavor in all three—a bitter apple, subtly saline taste—but, perhaps that is only the power of a name. Chamomile tea and a shot of anise. In herbal medicine, chamomile is traditionally used as an antimicrobial, antiinflammatory and antispasmodic. The tea is prescribed for colic or any stomach upset. My midwife used a dilute solution of chamomile to wash the eyes of my newborn son. Andalusian campesinos (field workers) start the day with chamomile tea and a shot of strong aguardiente, anise brandy. Chamomile makes a good hair rinse for blondes, to bring out golden highlights. It’s a soothing bath for prickly skin. 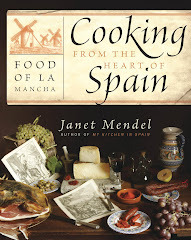 I chose to turn manzanilla into summer refreshment. Inspired by a bucket of end-of-season lemons, I made a chamomile-infused, whole-lemon lemonade. Very refreshing on its own, it would also be a bitter-lemon mixer for an alcoholic tall drink. 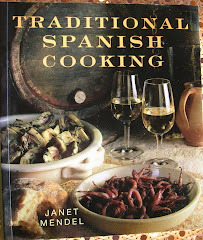 (Try it with aguardiente, an anise liqueur.) You will have to sweeten the lemonade to taste—I used stevia, a non-calorie sweetener—and dilute it with water to take the edge off the bitterness. 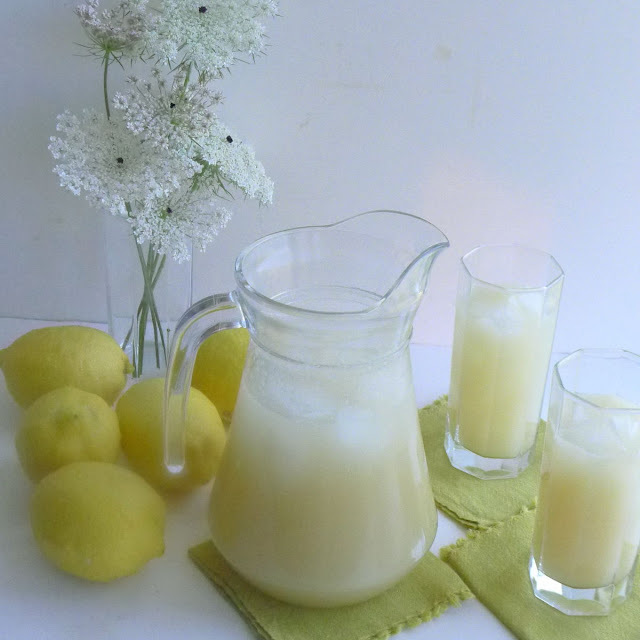 Made with whole lemons, this chamomile-infused lemonade has a grown-up bitter taste. Sweeten to taste. Bring 4 cups of water to a boil. Add the tea bags or flowers. Cover and let the tea steep until cool. Remove tea bags or strain out flowers. In blender or food processor, chop the lemons with 2 cups of the tea and sugar or sweetener. Strain the lemon water, discarding the solids. Add remaining tea and 1 to 2 cups more water. Chill the lemonade. 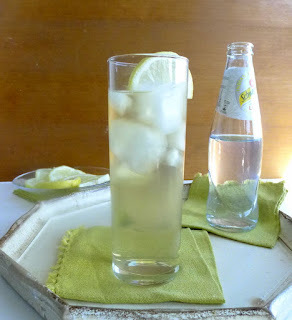 Herb-infused gin and tonic. Cool. Gin already has a herbal, botanical essence. Steeping chamomile in it adds another dimension. Use the infused gin for cocktails or for that ever-popular summer refresher, gin-tonic. 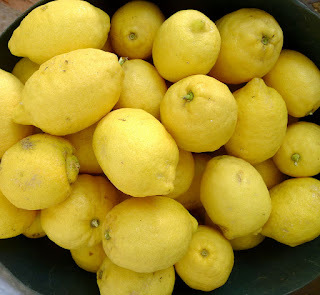 Open the tea bags and place the contents in a jar with the lemon zest. Add the gin. Close tightly and infuse for 24 hours or up to 1 week. 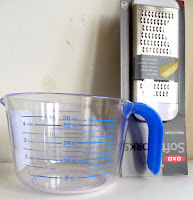 Pour through a fine strainer. Store in a tightly stoppered bottle. 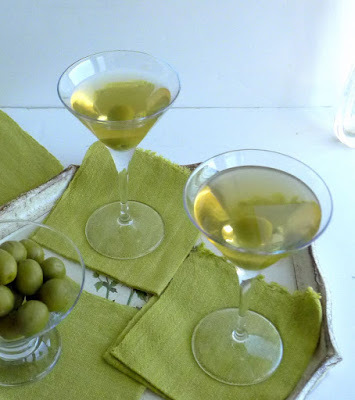 Manzanilla (herb) in the gin, Manzanilla (wine) in the martini and Manzanilla (olive) in the cocktail. 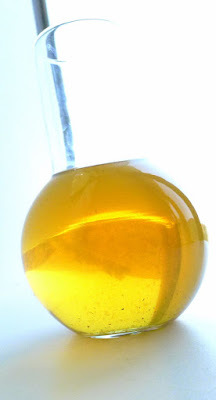 Manzanilla multiplied by 3: chamomile-infused gin, Manzanilla Sherry and Manzanilla olives. Chill the martini cocktail glasses. Place 2 olives in each. Place ice in a jar or cocktail shaker. Add the gin and Manzanilla Sherry. Shake or stir. Strain the martini into the cocktail glasses and serve. 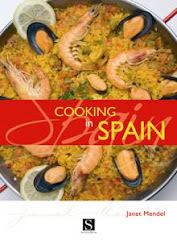 I'm back in MY KITCHEN IN SPAIN, after a trip to the US to visit family and friends. 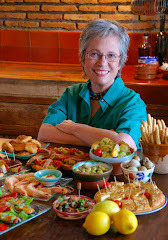 Alas, I am too jet-lagged to plan and cook and photograph a Spanish recipe (although, I've already made a big jug of gazpacho to take to friends' party). Take off. 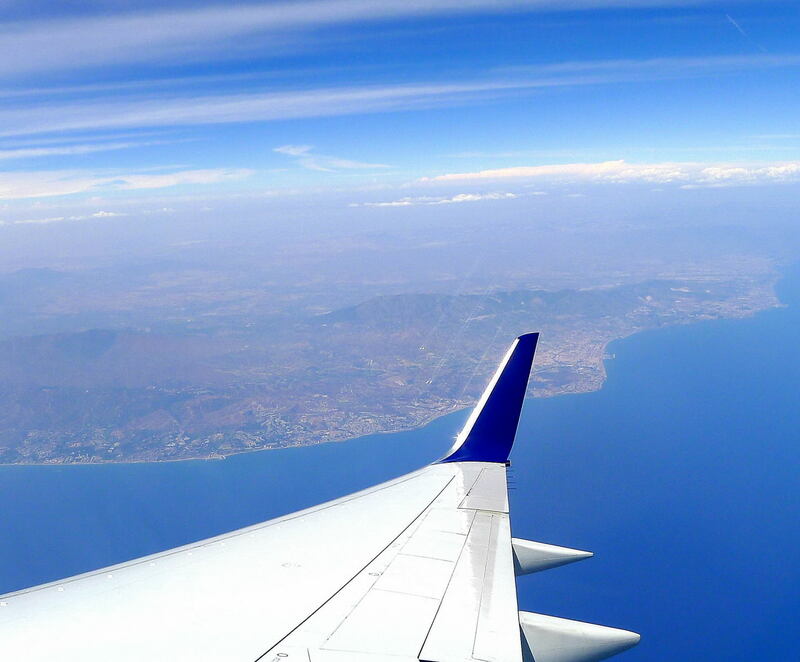 The Costa del Sol off the wing of Delta's direct flight, Málaga to New York. Almost I can see my house. I am savoring my trip as I unpack some food souvenirs. 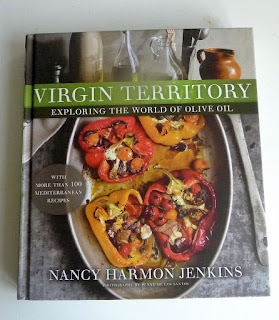 You might recall that I packed my bag with FOODS FROM SPAIN (see that article here) to take to the US (yes, the 2-liters of olive oil arrived without mishap). 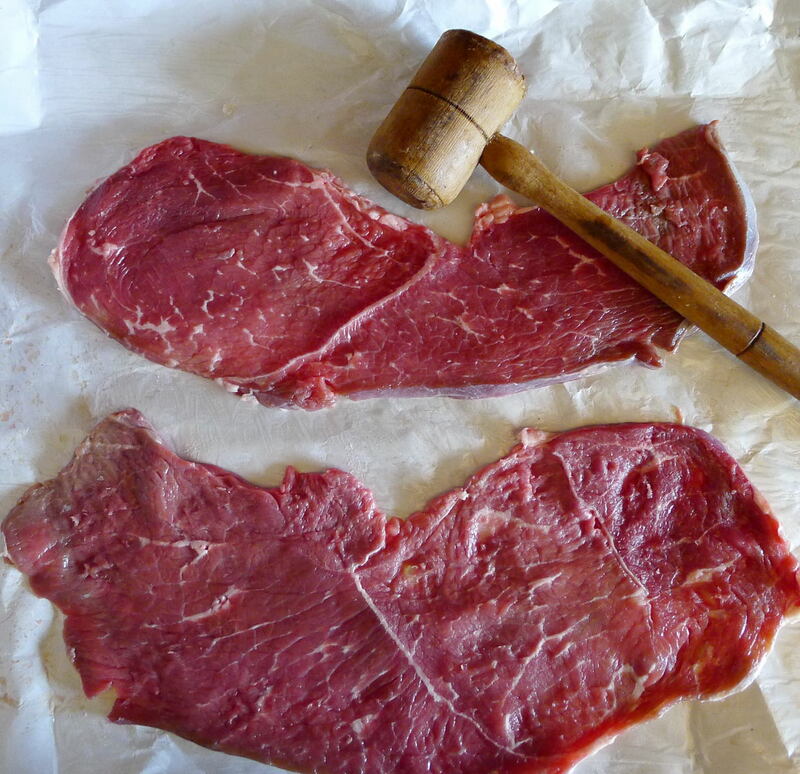 Now, I'm bringing back some foods from US markets. And, what a varied bunch of foods they are! My son Daniel Searl, who lives in the Atlanta area, is in charge of Hispanic Outreach at the WESTMINSTER SCHOOLS He takes a group of high school students to Guatemala every year, where they help folks in Antigua by building houses. The students sell Guatemalan coffee to help finance their trip. 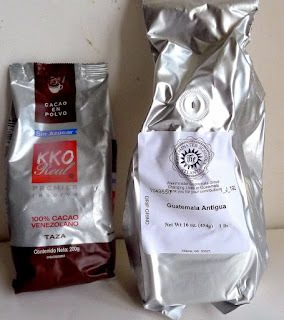 It's fantastic coffee and the $10 over the cost helps the program. Daniel's inlaws, Jorge and Juana Nieto, who are from Venezuela, gifted me with the packet of Venezuelan cocoa (as well as a tipico dinner of rice, beans and slow-braised beef). What a treat! In Georgia, I ate lots of Georgia peaches, in season now. 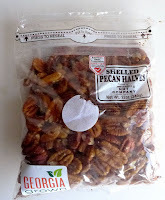 I brought back bags of Georgia pecans for gifts for friends. One of the food books I was looking for. We went to an Atlanta Kroger that had a large kosher food section, where I could find Hanukah candles and packs of matzoh. 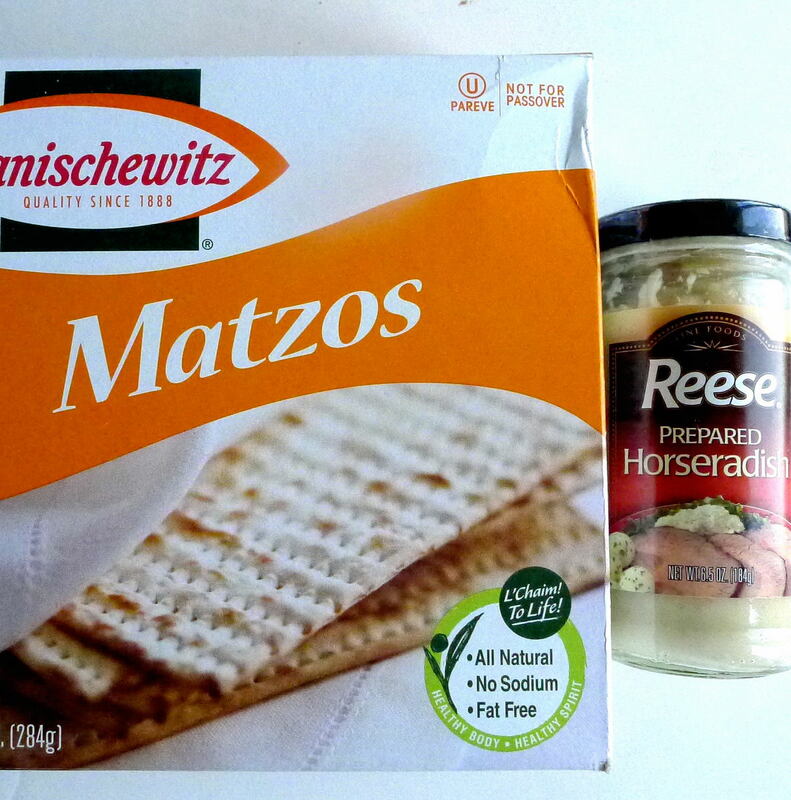 No, it´s not the season for Hanukah (around Christmas) or Passover (spring), but these are products not easy to find in Spain. I'll make matzo-ball soup in the winter. 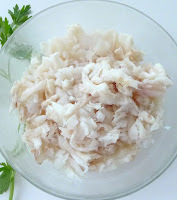 Oh, and some horseradish, for shrimp cocktail sauce and, possibly, even for roast beef. At the grocery store I also found a plastic measuing cup and a cheese grater, to replace ones that have given up the ghost. (My Microplane broke its handle--so I'm trying a different brand this time.) The 4-cup plastic measuring cup lost all the markings, so I couldn't tell 2 cups from 3 cups. This one also has milliliters. Packets of garden seed. Will there be bok choy? 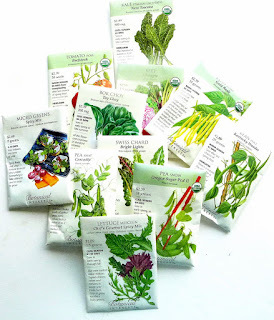 Daniel also took me to a garden center where I could find a selection of vegetable seeds. 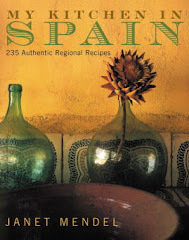 I'm after those I can't find in Spain--bok choy, arugula, red chard. Hope springs eternal with seeds! 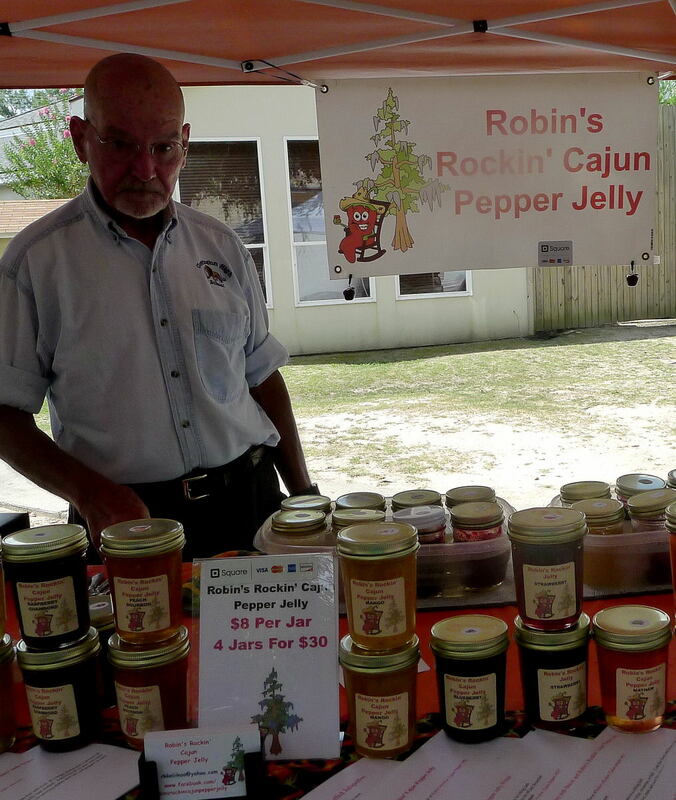 A selection at the Farmers' Market in Covington, LA. From Atlanta, I went on a 7-hour road trip to New Orleans (with a break-down of Daniel's mini-van near Montgomery, Alabama, where 50 years ago I joined the march for voting rights that started in Selma). Kids were great on a long trip--electronic devices plus spells of reading books kept them entertained. I visited all the main fast-food joints in America! My sister Elaine lives outside New Orleans. She took me to a farmers' market in Covington, LA., where I bought veggies for dinner and jars of Cajun pepper jelly sweetened with stevia (no-cal sweetener). After eating crawfish boil, filé gumbo and spicy shrimp creole, I had to have some New Orleans spice blends to bring home. 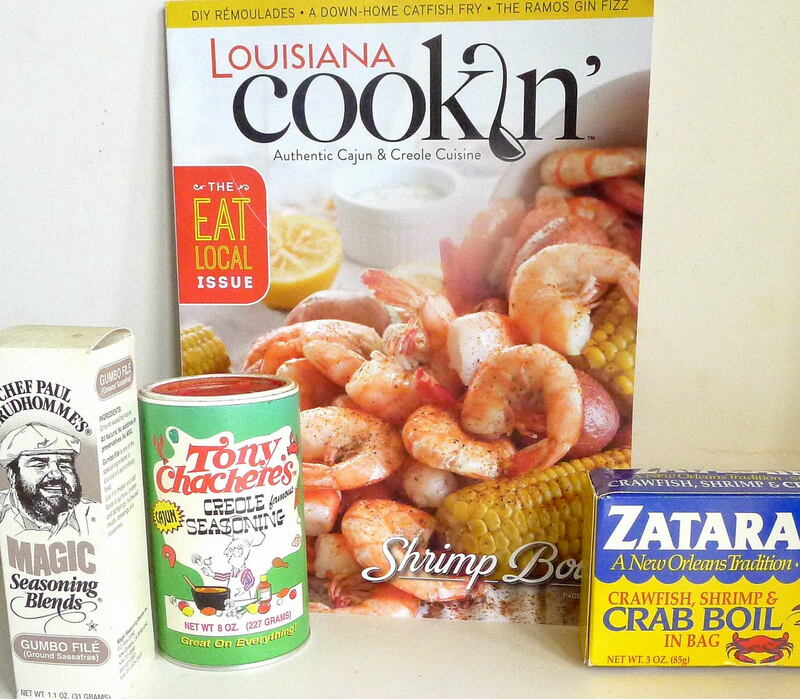 Plus, a magazine of Louisiana Cookin´ with lots of recipes to remind me of my trip. I've also got a box of Grape Nuts, a crunchy cereal with very little sugar; a jícama, a crunchy vegetable used in Mexican cooking and a package of farro wheat. New stuff to work with in my kitchen.